Book lovers seem to have it all sorted out, don't they? They never seem to have any boredom problem. They never mind waiting in long queues. Many of them, in fact, actually LIKE lengthy commutes. They never seem to stress over weekend-plans. They don't care if the Cable TV is not working. Or even the internet. Wherever they are, they simply pull a book out of their bag or the bookshelf, and time seems to just fly for them. Book lovers also have challenges. A very unique set of challenges, as a matter of fact. 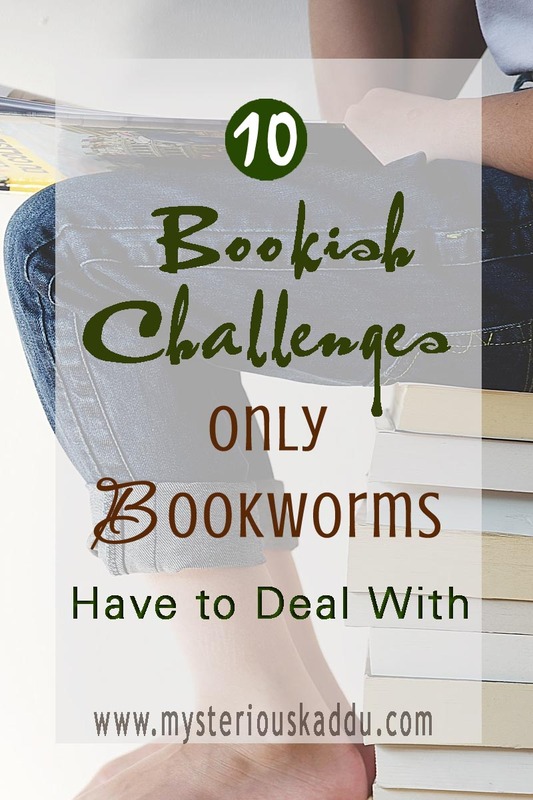 Listed below are 10 bookish challenges that only a bookworm knows and understands. They keep releasing new books (that you want to read) faster than your salary. Always. Every month, you tell yourself - "I won't buy any new books next month." But come next month, and once again, you end up buying more books than you can afford! You go to the store to pick up "only five" books from your wish-list, and you end up bagging 15 more that just "caught your eye". Face it. You are ALWAYS broke. That's the story of your life. At first you run out of shelf space for your books. So you buy more cabinets. Eventually, you run out of cabinet space too. And before you know it, you need a bigger house, just to accommodate your insanely expanding home library. But you can't afford a bigger house, 'coz of point number 1 above. (My personal nightmare.) You have your entire day's to-do list in front of you, but you just want to finish this "one last chapter". Oh but the plot is hanging on such a major suspense point. So you try to sneak in one more chapter, on the sly. And then one more. And... oops! No work done in the house. Nothing to eat. Sleep has become an elusive lover. And you're constantly eyeing your TBR pile. And wishing you had 4 extra days PER DAY just to read. (Another personal nightmare.) You get so involved in the book's story-line that you are unable to separate fiction and reality. Are you here? Or are you there? You are like a zombie. The characters of the book seem more real to you than the people you live and work with. You seem to get trapped in THEIR world, THEIR adventure, THEIR life's drama. And your own family members? embarrassing "public-giggling attacks"... in local trains, buses, office cabs... you name it! angry outbursts when you realize that the book you just finished has a sequel that's not yet been published, so you'll have to wait for it. week-long depressions when you finish a long series, like Lord Of The Rings. After reading Harry Potter, how many times did you try to use the "Accio" charm to summon random objects to you because you felt too lazy to get up from your bed? Or tried to research the history of ancient Egypt on Wikipedia after reading Wilbur Smith's Egyptian Series? Because you're a social snob. You judge people on whether they read or not. You even judge them on their choice of books. Plus you're a social recluse. You'd rather curl up on the sofa with a good book than attend some long-lost cousin's wedding, or get drunk at the local pub with a bunch of noisy friends, or watch some sweaty, over-aggressive players chase a ball (or kick one, it's all one and the same anyway) over a field...! Bottom-line: You'd rather be with a book than with a real person. Period. First of all, you don't have that many relationships, 'coz that would require you to pull your nose out of your books once in a while. But, the few who're just mandatorily there, i.e. your immediate family and close friends, you can never figure out how to NOT get irritated at them for interrupting you in the middle of EVERY SINGLE BOOK you read! And if a friend borrows a book from you and loses/damages it? Because you have read the original masterpiece. You know exactly what happens in the plot. You know exactly what each character says and does. You even know exactly what s/he thinks and feels! So you find it very irritating when they omit half of the book from the movie, 'coz then every time you see the movie, you have to read the book again to fill in the blanks. You spend an hour at the bookstore, shortlisting books you want to buy, and then ANOTHER half hour, deciding which ones to leave this time, 'coz you only have so much money. You stand in front of your bookcase like a statue, wondering which book you ought to start on next - one from your TBR pile, or one of your old favorites again. And if someone asks you to talk about your favorite book? Now you see? The life of a bookworm is not so easy after all. How many of these bookish challenges have you had to deal with? Which one of these is your biggest personal nightmare? 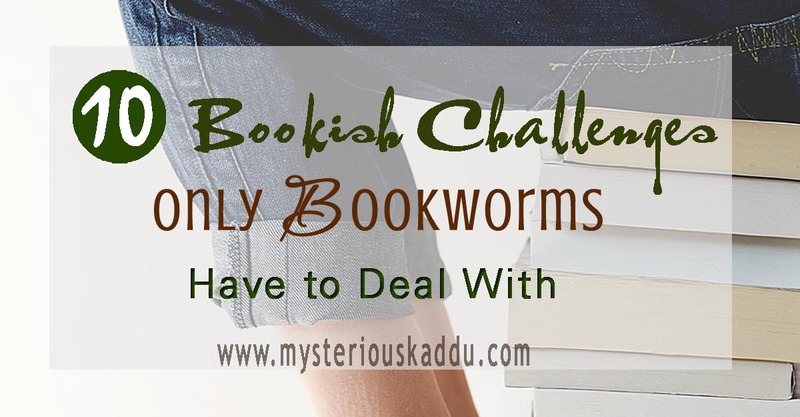 Have you faced any other bookish challenges too? And here's more in "#TenOnTuesday"! This is my second post for A to Z 2019. I love this post so much! And can identify with each of your challenges. It’s so tough being bookish. Visiting from AtoZ. I will be back to visit again for sure. Hahaha, what a fun post! You write so well gosh!! I went into rofl mode while reading your post. This is so me, specially the space management and unsocial lifestyle. At one point, my Dad had told me if I purchased any more books, he will send me to a rented apartment because the house felt like a library with our set of books. Lovely post. SO identify with the numbers 3,4,5, and oh....almost all of them!!! I do think thrice before buying a book. As much as I want to, I try to look for a free downloadable copy. So, yes, I am pretty careful when it comes to spending, but I get so emotionally invested in the story. Case in point: The Book Thief, The boy in the striped pajamas.....I cried my heart out and then went looking for more such books set in that time. Oh my my my! Haha! I can relate sso much to all the points mentioned here, Chikki :D I will also add difficulty transporting books whilemoving homes, especially for us where we get postings every 2-3 years. Phew! Ha ha that was a fun post and bit too near the truth. Time and space management is an issue and of course book hangovers are ever so real! Aah! You have shared the challenges of book lovers so well. I am forever eyeing new books, my cupboard is overflowing and I have no space to store more books and I wish I could read all day. And emotion management is tough when in public. I have laughed like crazies and cried too in a public place while reading books. and book hangovers.... god... dont get me started on that!! Loved this post, Kadambari. Electronic books definitely help with the space issue! I still have more physical books than human should have.